I wasn’t even going to read this book because I tend not to like war books – even so-called “anti-war” books (movies). But three people in the small Modern Fiction Reading Group gave the book a 10! I thought maybe I should at least give it a try. I mean I love Cormac McCarthy’s Blood Meridian – that’s a 10! So I read it – was very impressed but Marlantes is no McCarthy or Faulkner although I see the influences. 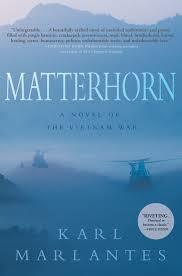 What Marlantes has written is very much his own work. Yes, Matterhorn is an incredibly well written, page-turning, fictionalized account of the horrors of the Charlie Company (and others of similar duty) in which I grew to really care about the major characters. There’s no particular “history” there, and the single “theme” is basically the stupidity and incompetence of the war in Vietnam and how it impacted the very young men actually fighting it. The dialogue feels right, the structure is straightforward as befits a narrative like this, and Marlantes uses appropriate metaphors and tropes. Those are the criteria by which I usually rate general fiction and they can make a novel “literary” – this is not just a matter of well written setting and character development, it’s certainly not due to a good plot line. “Literary” narratives use compelling themes, unique language, appropriate metaphors, an interesting structure, etc. So – does Marlantes’ book meet my little test of literary? Yes, for sure – it’s far more than a page-turning, plot-based story of men fighting a really dirty war. And I love Blood Meridian – the language overcomes the violence – it just does. So too with Matterhorn where the story, the language, the characters, the whole is way more than any one piece. That said, Marlantes’ debut novel is not an anti-war book, imo, but neither was War and Peace. War is hell – no one denies that – the John Wayne movies re WWII were different only because we won – and they were about our “good” war. Those movies glorified what the armed services did – what the US did. (And Wayne made one Vietnam movie – The Green Berets.) This isn’t much different – the difference is that the US lost – lost badly – and this book shows a big chunk of why. The original Fish Cheer aka I Feel Like I’m Fixing To Die by Country Joe. Okay fine. What I don’t like is graphic violence. Oh well …I loved Blood Meridian and I’ve been reading a lot of Scandinavian crime novels – they’re pretty grizzly – but NOT literary! So Matterhorn is an extraordinarily fine example, and Faulknerian in at least one place, of the worst of the war in Vietnam – the front lines, It depicts the nice young boys who were pulled away from home and college to be trained as killers and a part of Charlie Company (renamed Bravo Company) and ordered to take Hills 400 and 484 (combined and renamed Matterhorn in the book). We didn’t win, so there was never a real cheering moment and not much way any post-war book or movie can glorify our military activities in Vietnam. (Fwiw, John Wayne’s Green Berets was produced in 1968 – barely into the war.) The guys who came home were not heroes unless they did something individually – they were often thought of as baby-killers or suckers – most often they were the victims. But Matterhorn shows these kids to be courageous, loyal, angry, homesick, wounded – and enormously sympathetic human beings. Matterhorn shows the bad stuff while the troops were actually in the war zone, out in the field, taking hills and marching on, making forts and leaving them, getting shot at, shooting back, going without food for days and necessary medical supplies. There is an incident where a marine is attacked by a tiger but other men die too, and then their team members have to drag their dead with them for lack of helicopters. They have to leave their base to help another group and then go back and re-take it. That was the strategy of attrition which the Vietnamese used a whole lot better than the US. The boys/men watched their buddies get killed from incompetent leadership as often as from enemy attacks. And the book includes the difficult themes of incompetence and bravery, stupid commanders, racism, immature soldiers (Marines), drugs, grief, and all the rest. No wonder so many of them came home with PTSD. I feel like I lived this through the lives of the 26 Porterville guys who died over there (or 16 or 30) – I saw one guy come back wanting to return so he could kill. I knew the wife of a POW – proclaimed deceased – who returned. I saw the polarization of a good town and I protested as I was able – so what? I haven’t been interested in reading about it – actually, I couldn’t read about it – until a couple years ago when I read The Things They Carried (Tim O’Brian) which was pretty good and Fire in the Lake (Frances Fitzgerald) the Pulitzer Prize winning nonfiction about the mind-boggling incompetence and catastrophe that was our War in Vietnam. Yes, Marlantes (link to Bill Moyers site) erved and is a highly decorated veteran – he spent 30 years getting this novel published and it shows in a what really turned out to be a love letter for those guys in the field.